Pradip Maitra, Hindustan Times, reports that in Vidharba, 46 farmers growing Monsanto’s Bt cotton died after inhaling poisonous pesticide whilst spraying the crop.. As pests had become resistant to pesticides formerly used, stronger formulations were being used with little or no protection – as Devinder Sharma points out in an earlier post. Most of the deaths were reported from Yavatmal, a major cotton-growing district that has often been in the news for farmers’ suicides. More than 500 others have inhaled the poisonous spray and fallen sick, and are admitted in various hospitals. A few have already lost their vision, hearing or speech. More may die during treatment. As the death toll continues to rise, the chief minister Devendra Fadnavis ordered an inquiry under a special investigation team (SIT) to probe the matter. The Quality Control of the state’s agriculture department on Wednesday raided 12 different godowns of pesticide companies and sealed those stocked to prevent further sales, seizing pesticides worth Rs 14.31-crore from Akola in western Vidarbha. The Maharashtra State Agriculture Mission chairman Kishore Tiwari demanded a ban on chemical farming and encourage organic farming in the region. Tiwari, who is camping in Yavatmal after the incident, dubbed the entire episode as “genocide” and demanded to book the concerned multi-national manufacturers and concerned department, in this regard. Tiwari has appealed to the state government to stop the use of harmful products to put an end to farmer fatalities and give compensation of Rs 5-lakh to the victims’ families. He alleges that the deaths are due to the vested interests of the regulatory officials in the agriculture department and administration’s negligence. 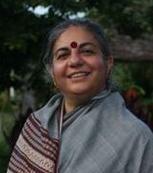 Vandana Shiva draws our attention to her article in the Deccan Chronicle. On one side of the debate over genetically modified organisms is scientific evidence that GMOs are not delivering on their promise, and on the other side is ideological propaganda by the genetically modified seed industry and scientists whose careers are locked into the GMO trajectory. After two decades of commercial applications, data clearly shows that GMOs do not increase yields and do not decrease the use of agrichemicals, but have instead created super-pests and super-weeds. It is because of these failures and the fact that GMOs are linked to patents, which translates into royalty extraction and high prices, that GMOs worsen the economic status of farmers. India has witnessed more than 2,84,694 far­mer suicides in a span of 17 years, between 1995 and 2012. The worst off is Maharashtra, which has the maximum area under cultivation of genetically modified Bt cotton . . . Farmers chose Bt cotton not because it was the best alternative but because all other alternatives were destroyed. The seed varieties were replaced. India’s Central Ins­titute for Cotton Res­earch has not released any public varieties after Monsanto entered the market, and most Indian seed companies are locked into licensing arrangements with Monsanto. Nor is it true that yields have incre­ased. Yields of cotton in the pre-GMO period reached 1,200 kg in good years. After Bt cotton was introduced the yield has stagnated at 500 kg. As the University of Ca­n­terbury research team led by Prof. Jack He­i­nemann has shown, North American crop production has fallen behind that of Western Europe, despite farmers in the United States using genetically modified seeds and more pesticide. According to the team, the main point of difference between the regions is the adoption of GM seeds in North America and the use of non-GM seed in Europe. The failure to control pests has led to an increase in pesticide use. A study published in India’s Review of Agrarian Studies also showed a higher expenditure on chemical pesticides for Bt cotton than for other varieties by small farmers. Non-target pest populations in Bt cotton fields have exploded; it is expected that this will likely counteract any decrease in pesticide use. In China, where Bt cotton is widely planted, populations of mirid bugs — pests that previously posed only a minor problem — have increased 12-fold since 1997. A 2008 study in the International Journal of Biotechnology (see abstract) found that any financial benefits of planting Bt cotton had been eroded by the increasing use of pesticides needed to combat non-target pests. In the US, due mainly to the widespread use of Roundup Ready seeds, the use of 4 herbicide (a group of herbicides) increased 15% from 1994 to 2005 — an average increase of one-fourth pound per each acre planted with GM seed — according to a 2009 report published by the Organic Centre. Moreover, the rise of gly­phosate (the herbici­de in Roundup) resistant weeds has made it necessary to combat these weeds by employing other, often more toxic, herbicides . . . This trend is confirmed by 2010 USDA pesticide data, which shows skyrocketing gly­phosate use accompanied by constant or increasing rates of use for other, more toxic, herbicides . . .
. . . Bt cotton has not given higher yields. It is not disease resistant. Disea­ses that never affected cotton, like aphids and jassids, have exploded. In India the bollworm, which Bt cotton was supposed to control, has become resistant and Monsanto has had to introduce Bollgard II, a higher variety of insect-resistant genetically modified cotton. All this has created debt not profits for farmers. If seed costs jump 8,000 per cent and pesticide use increases 1,300 per cent, farmers’ incomes do not increase. Good science looks at evidence and takes feedback from the real word. Bad science that shuts its mind to evidence and be­comes propaganda. Sa­­dly, in the GMO deb­a­te, those defending GMOs have only power and propaganda on their side. 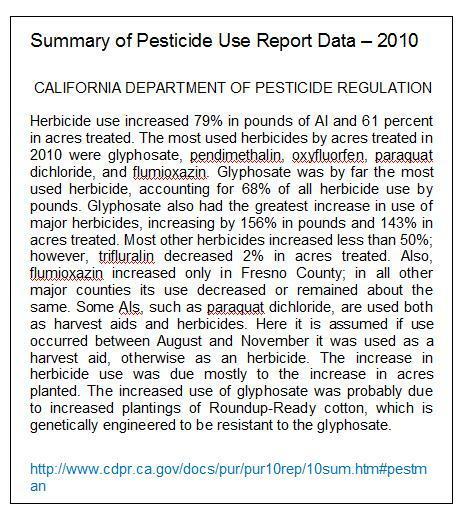 A direct link to 2010 USDA pesticide data was not found but there was a similar passage in the 2010 Californian report below (AI, active ingredient?). Thanks to Theresa, whose lead was followed up, a full account was found in the Times of India. Though this information was reported a year ago many – like me – will have missed it. For those we report that Bt cotton seeds sold by Maharashtra Hybrid Seeds Company (Mahyco), a partner of US multinational Monsanto, were banned because they were of ‘inferior quality’. The company’s licence was cancelled after widespread complaints accusing the company of supplying inferior quality seeds which aggravated the agrarian crises in rural Maharashtra and spurred suicides among farmers. Following the ban, there were reports of raids being carried out on some stockists in eastern Maharashtra. Certain Bt cotton variants are suspected of toxicity, damaging public health and environment, and agriculture activists have been demanding a complete ban on Bt technology in India. Dr Brian John (GM-free Cymru) comments on an emailed reference to a Financial Times report of what some commentators call the ‘annual ISAAA spinfest’: “never take anything from the International Service for the Acquisition of Agri-biotech Applications (ISAAA) seriously”. “Naturally, some of the media who are inclined to support GMOs will make the most of whatever is fed to them by Clive James founder and chair”. A report in China’s People’s Daily recorded that China had ‘brought in’ some 5 million farmers to cultivate Bt cotton. The genetically modified cotton was projected as a ‘silver bullet’ for the Chinese small cotton producers. The public had been “repeatedly bombarded by industry drones of how successful the introduction has been for the farmers” and by now, considering all the promises of increasing ‘productivity’, this success should have led to reports of China’s emergence as the foremost global supplier of cotton. Four years later the Guardian reported: “Millions of hectares of farmland in northern China have been struck by infestations of bugs following the widespread adoption of Bt cotton, an engineered variety made by the US biotech giant, Monsanto. Sharma continues: “In India, the corporate media kept the story alive. Every now and then I find articles detailing the promises of GM crops. More often than not these are based on wrong facts. Read the rest of the article and see Monsanto – implicitly accepting these figures -‘ducking and weaving’ – and blaming the Indian farmer . . .
“Maharashtra, a state in western India, has seen a drop in the yield and production of Bt cotton in the past one year, especially in the dry regions of Vidarbha, that receives low rainfall. This is despite the fact that at the time 95% of the total land sown in the state comes under Bt cotton cultivation. Also, cost of cultivation is taking a toll on farmers. Labour is scarce. The cost of cultivation for a farmer ranges between Rs 15,000 and Rs 20,000 per acre. This excludes land rentals. Labour for picking and weeding takes 60% of the cultivation cost”. Keerthana Nagarajan reported on Radio Netherlands’ website: “An estimated 7300 farmers have killed themselves in drought-stricken Vidarbha since 2004 – the year that the government introduced a policy to grow Bacillus thuringiensis or BT cotton, a genetically modified variety of cotton”. New Delhi’s NDTV reports that a group of NGOs has claimed that the government’s own data proved that BT cotton has resulted in stagnant yields, pest resistance and evolution of new pest and disease attacks, and quotes allegations that the failure of BT cotton is the root cause of farmer suicides claiming over 10,000 lives so far in the state. Two years earlier there were candle-light protests on the eve of US President Barack Obama’s visit, seeking to draw his attention to the plight of agriculture sector in the region. Further evidence that – as Dr John advises – industry figures proclaiming GM successes should not be accepted at face value. See also cases against Bayer CropScience (substandard GM seeds 2013) and Maharashtra’s 2012 cancellation of Mahyco Monsanto Biotech’s license to sell its genetically modified Bt cotton seeds.